Everyone is getting hilariously rich from cryptocurrencies... and you're not... yet! Right now we're smack in the middle of the biggest get rich quick boom in history. Cryptocurrencies are rocketing 3,028%, 9,790%, 13,558% even 694,900%. So if you made the smart decision to get in on this profit frenzy early… congratulations! But if you've missed out so far, I want you to pay very close attention to what I'm about to tell you. Because the nearly half a trillion dollars in wealth that has been created up to this point is just a tiny blip compared to what's about to come. Thanks to three upcoming events, billions of dollars in crypto-riches are on the way. In fact, we could soon be looking at a total market cap of a trillion dollars or more in 2018. And if you pay close attention, I can show you the easiest way to grab a huge chunk of this wealth for yourself. Not just a one-time shot. I’m talking about raking in cash from dozens of cryptocurrencies day after day after day. It’s the same method I used to get into Bitcoin back in 2013 when everybody thought I was crazy for even talking about it. But if you had listened to me and put up a small stake in Bitcoin back then, you’d be sitting on over $1 MILLION today. And while the Bitcoin boat may have already sailed for the average investor, there are now 1,300 potential “new” Bitcoins just getting started. Most people have never heard of this digital currency, and for good reason. Only a few months ago Ripple was trading for less than a penny. Since then it has spiked an incredible 15,657% … and it could very well be just getting started. Had you invested a mere $100 in Ripple just a few months ago, you’d be $15,657 richer today! A slightly larger investment of $1,000 would have netted you $158,570. And a stake of $5,000 in Ripple would have made you a small fortune - $782,850 to be exact! Since January it’s skyrocketed an astounding 20,133%. Yes, that’s not a typo: Qtum has gone up an unheard of 20-THOUSAND percent. A mere $100 investment in Qtum (less than what you probably pay for your cable bill) and you’d have pocketed $20,233! Even better, had you gone a little higher and invested $5,000 – you’d be a millionaire. A $5,000 investment in Qtum would have given you a $1.6 million windfall in less than three months. Amazing! Ripple and Qtum are just two examples. Right now I'm counting… 15 cryptocurrencies that have gained over 1,000% since the beginning of this year. That means had you invested a mere $100 in Verge a few months ago, you’d have $694,000 in the bank right now. “Hey, honey, we have $694,000 sitting in the bank right now! Well, today I’m going to show you how to make it a reality. First, even though the gains I’ve just shown you are already through the roof… dozens of cryptocurrencies are just getting started. Yes, it’s probably too late to become a millionaire from Bitcoin. After all Bitcoin is going for over $10,000 per coin. That’s way too expensive to make a big amount of money in a short period of time. Nearly every other cryptocurrency on the market right now is trading for only a few bucks – even pennies on the dollar. A $100 investment will become thousands and even hundreds of thousands of dollars overnight. And then continue cashing in for the rest of your life – no matter what happens in the market. You'll be amazed at how easy it is. I don't care if you don't have a broker – or a bank account. I don't even care if you never invested a penny in your life. If you follow the instructions I'm going to lay out for you here today, you'll become crypto-rich — within a year or less. And you can start with nothing more than $100. As I just mentioned there are about 1,300 cryptocurrencies in existence right now. But many of those are pure garbage. If you want to get rich from this boom, you have to understand some rules, specifically which cryptocurrencies to play – and which ones to avoid like rats. It basically started in Silicon Valley where I've been for the last three decades. And, as I'll show you in a minute, I am intimately familiar with many of the brilliant people behind the most successful cryptocurrencies. I've talked to quite a few of them in person. In fact, I just flew the co-founder of Ethereum, one of the hottest cryptocurrencies on the market, to my office to discuss this crypto market in detail. He revealed some potentially very lucrative information on an upcoming event… and I have the whole amazing interview on video. More about this in a moment. The point is, I am one of the rarely qualified people who can show you the best cryptocurrencies to invest in – while minimizing your risk. Finally, point number three may be the most critical of all. Right now, your timing is actually perfect. Three events of profound importance are about to take place that could send prices soaring beyond anything you've seen already. Any doubts you ever had about getting into cryptocurrencies will be thrown out the window. In fact, I can practically guarantee that any one of these events by itself will create a geyser of cryptocurrency profits that will completely blow away anything that’s come before. But when you add the impact all three of them will have together – it’s so mindboggling how high specific cryptocurrencies could fly. Together, these three events could even send Bitcoin to a price of $100,000 per coin. I’ll reveal everything today in this presentation. Incredibly, all three events are scheduled to happen in succession… within weeks of each other. These events are coming directly in response to the huge impact cryptocurrencies are going to have in the financial markets. In short, a new world order is being created by this crypto market. This is NOT hyperbole. It’s just the reality of the situation we live in today. The fact is, whether you like it or not, cryptocurrencies are completely turning the investment world upside down. And these three events are going to spark a massive run-up in prices that will could make more millionaires than the dot.com boom and the smartphone boom combined. That means for the biggest gains, you’ll want to time these events perfectly. I can show you how. In fact, I’m going to give you all the details in just a moment. I’ve spent 33-years in Silicon Valley as an analyst, board member of a prestigious venture capital firm – and senior advisor to 12 high tech startups. In 2012 I became a Bitcoin-fanatic. Back then, it was so cheap, I was buying some for myself and even transferring coins over to friends and family literally just for the fun of it. But in June 2013, I realized Bitcoin was no fad. And I became one of its biggest backers. And then, in June of 2013, I made it my mission to help ordinary Americans strike it rich with Bitcoin. I teamed up with the most reputable financial publisher I could find, Money Map Press, to publish a Bitcoin wealth training kit. I filmed a video where I recommended my readers strike fast and get into Bitcoin. 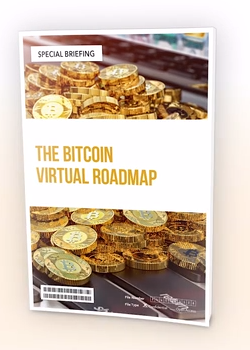 I also wrote one of the earliest books ever to recommend cryptocurrencies as an investment called The Bitcoin Virtual Roadmap, which showed hundreds of thousands of Americans unique ways to make huge gains from Bitcoin. I continued to back Bitcoin, even after it hit some serious growing snags and a lot of so-called “brilliant” investors were saying it was a fluke. If Stuart and his viewers had listened to me then, they could have turned $1,000 into $253,000. He says he made over $39,000 in a month and a half. 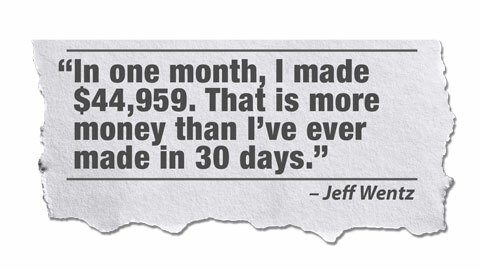 And Jeff Wentz says he made nearly $45,000 - in under a month. Now he's targeting his first million. Today, the opportunity we’re seeing has grown even bigger than I ever anticipated. Now, it’s not just Bitcoin. It’s literally dozens of cryptocurrencies making everyday folks rich overnight. Like Ronald Whitehead, a 36-year-old IT specialist who turned a $500-$600 investment when he got in, into a stake worth $600,000 today. Or Ellen Bradley, a notary in Atlanta, who turned a $5 bill into a $10,000 windfall. Or John Travers, a 21- year old personal trainer who turned $2,000 into a stake worth $1 million. All of these folks were able to turn a small stake in an up and coming crypto-currency and turn it into a fortune faster than they ever thought possible. There’s never been a better opportunity in history. All it takes is learning my simple tricks - and doing them over and over again. Look at how many of these cryptocurrencies have soared already. Every day people, all across the U.S. are cashing out from these winners. But the gains are going to get even more lucrative in the next six months. The market size of the cryptocurrency market is expected to double in value from nearly $500 billion to $1 trillion. One of Wall Street's top players, the billionaire investor Michael Novogratz goes even further, estimating that the crypto currency market could reach $5 trillion as early as 2022. Novogratz see's Bitcoin hitting $40,000 by the end of 2018. And when Bitcoin soars, so will a host of other cryptocurrencies. That's why you owe it to yourself to get in now. Even if you've never made any investment in your life. Cashing out with potentially hundreds of thousands in the bank can be very easy… if you understand the secret to playing this market. Which is exactly what I'm going to show you how to do today. I'd also like to give you my complete Master Class Cryptocurrency Wealth Kit… free of charge. My Master Class Cryptocurrency Wealth Kit is a comprehensive package of every possible resource you could need to make money from cryptocurrencies. It starts with my new book: The Beginner's Guide to Cryptocurrency - which gives you all the ground floor basics you’re going to need to get your mind wrapped around this entirely new way of making money. You’ll learn how this market works… who the major players are… growth projections and market catalysts… a big picture view from 60,000 feet… as well as a close-up, highly detailed look directly into every aspect of the cryptocurrency world, from Bitcoin and beyond. 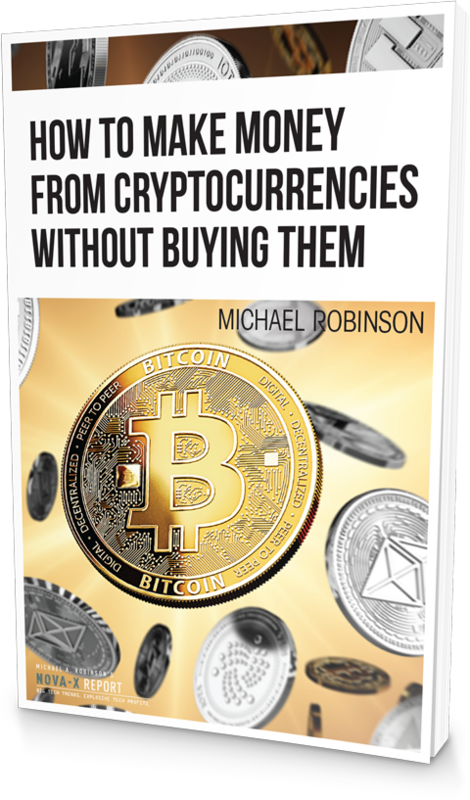 Most importantly… The Beginner’s Guide to Cryptocurrency reveals my secret strategy for making money from these digital wonders day after day after day – for the rest of your life. It’s the same secret strategy I’ve aleady used to show hundreds of thousands of people how to get rich on Bitcoin when it was trading for just $90. Remember, Bitcoin soared to $20,000 per coin. So folks who took my advice had a chance at over 22,000% gains… enough to turn a measly $100 into over $22,000! A slightly larger investment of $5,000 would have turned into an incredible $1.1 million! Now, with dozens of “new Bitcoins” going for far less than $90, you have a chance to make these kinds of once-in-a-lifetime gains all over again. That’s exactly what I’m going to show you how to do in The Beginner’s Guide to Cryptocurrency. In fact, after you immerse yourself in the big picture, we’re going to get very specific. In this comprehensive guide, you'll learn the absolute best cryptocurrencies to buy into RIGHT NOW. We culled through nearly 1,300 cryptocurrencies, crossing out the ones that have little or no value, and whittling down a list of the very best digital wonders you should invest in now – without hesitation – regardless of what happens in the markets. Yes, you can expect volatility. But if you follow my lead, you can turn that volatility into regular profit opportunities. This is a brand new market, and it goes without saying there will be some ups and downs. That said, as you'll see from my detailed report, if you invest in the cryptocurrencies I recommend, you'll be shielding yourself from losing your shirt on cryptocurrencies that end up vanishing into thin air. The single most essential starting point to getting into this market today is making sure you have the right investments. And that's what I'm going to reveal in The Cryptocurrency Secret Weapon: Your Roadmap to the Digital Treasure Trove…. We've taken the entire market and boiled it down to the single best cryptocurrencies to buy into right now. My method for racking up big gains on crypto's day after day after day is very detailed. And you'll learn all of it step-by-step in The Cryptocurrency Secret Weapon: Your Roadmap to the Digital Treasure Trove…. 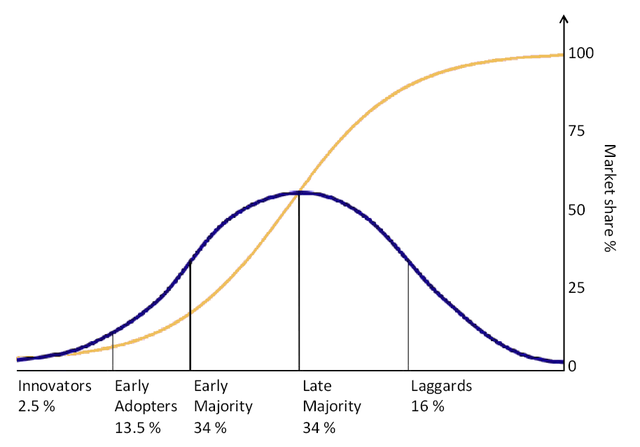 What you're looking at here is what I call the five Customer Segments of Technology Adoption. This is a system I've developed over my 33 years of being on the front lines of Silicon Valley tech investing. You see, investing in cryptocurrencies is not that much different than investing in the hottest Silicon Valley start-ups…which I've been doing successfully for 33 years. There's a specific pattern - a unique curve I look for that tells me when to strike. And I've been using it to pick out cryptocurrencies that are on the verge of breaking out. Again, all the details will be provided in The Cryptocurrency Secret Weapon: Your Roadmap to the Digital Treasure Trove….but to simplify here, cryptocurrencies fall within one of the five segments – and it's very important to break them down this way for reasons you'll soon see. But which segment is a buy signal? HINT: You want to begin investing exactly where that red line sits on this chart below. Do that and you can help avoid inherent risks, and put yourself in position for the fastest and easiest gains. 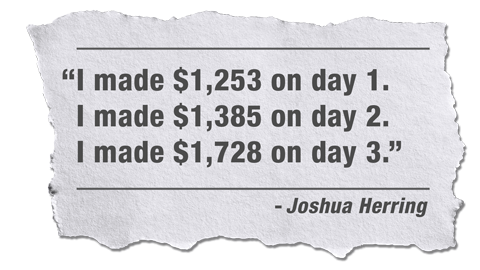 I’m talking about turning $100 into hundreds of thousands of dollars within months – maybe sooner. Is there ever a sure thing? Of course, not. There are no guarantees in any type of investing, whether its Fortune 500 blue chips, Silicon Valley tech firms – or cryptocurrencies. But my strategies help you pinpoint the specific opportunities that give you the best chance to succeed right now. There are better and faster way’s to take advantage of this boom. In my Master Class CryptoCurrency Wealth Kit, I’m also going to give you a complete VIDEO SERIES demonstrating a slew of other ways to play cryptocurrencies that could have you collecting a non-stop series of paydays. I'll show you how to secure "wholesale cryptocurrencies"
If you like the idea of buying cryptocurrencies for a price that can be up to 50% cheaper than the market rate, wait until you see this! I'll then go one step further and reveal how you can get advanced $5,000 worth of cryptocurrencies without taking any money out of your pocket at first. Just imagine if you were able to ride this "cryptocurrency advance" until your stake is worth $23,150 or more before you have to actually pay for it. It'd be extraordinary, but who wouldn't like a chance at making 5-figures on a cash advance? This is a method where you make five unique trades over the course of five months... and it could potentially pay you seven figures! In fact, I'll show you how this 5-5-7 Combo could've recently transformed a single $100 bill into a $1,278,307 windfall! By implementing a very specific strategy, along with some luck and fearlessness, you could've made $370 a day over the last month from this. All this will be shown step-by-step in The Ultimate Crypto Playbook video. Now, if you only have a few bucks to spare, I've pinpointed a "5-to-1 Cryptocurrency Multiplier." It's a way to get paid $5 for every $1 move in cryptocurrency. You just set it up once and it automatically kicks in if, and only if, a very rare event occurs. If it doesn't you never have to pay a penny. If it does though...your windfall could be legendary.. If you are sick of traditional investments like Blue Chip stocks paying only 2% yields, you will definitely want to hear about what I call "Cryptocurrency Dividends." Oh, and those "Cryptocurrency Dividends" can be paid daily too. My next video is called Retire on Crypto Easy Street: Flip on This 200% Income Stream, Kick Back, and Watch the Paychecks Roll in. Picture getting in on the ground floor of the next Uber, AirBnB, or Facebook! The Crypto-Billionaire's Roadmap to Unimaginable Wealth. 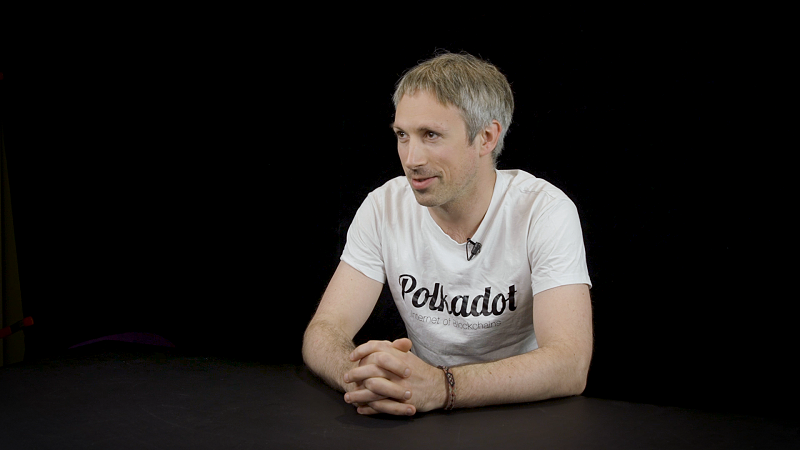 This is my exclusive video featuring the brilliant Dr. Gavin Wood. He'll show you how to become a prolific angel investor like the folks on Shark Tank, and how to use certain cryptocurrencies to fund the hottest startups through Initial Coin Offerings – otherwise known as ICOs. All of those videos and reports that can vide you a once-in-a-lifetime fast track to a Cryptocurrency fortune can also be found in my Master Class Cryptocurrency Wealth Kit which I want to send you for free today. 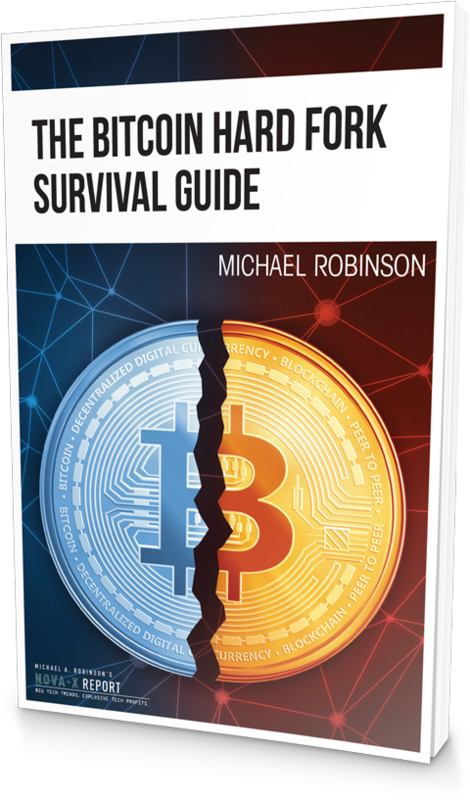 That means you'll get my brand new book The Beginner's Guide To Cryptocurrencies...which will give you all the information from A to Z you need to get started. Plus, another brand new volume called The Cryptocurrency Secret Weapon: Your Roadmap to the Digital Treasure Trove which gives you specific and potentially highly lucrative cryptocurrency opportunities you can play right away. Again, just so I'm clear. You will ALL of these special cryptocurrency investing videos as part of my Master Class Cryptocurrency Wealth Kit - for free. That can be a good thing because it gives us a chance to make the most money. But it also means there will be quite a lot of volatility and some added risk. My life's mission is to make sure my readers have everything they need to succeed while keeping their money safe. So, I’m also going to reveal a critical investing technique I learned from one of the world’s most brilliant cryptocurrency leaders. He’s not only a scientist and crypto developer, he’s one of the original founders of Ethereum, a cryptocurrency that has soared nearly 10,000% this year. His name is Dr. Gavin Wood. My team and I actually flew Dr. Wood in from his office in Europe to give us the inside scoop on this. I have the footage – and I’ll share it with you as part of your free Master Class Cryptocurrency Wealth Kit. In fact, in this video, Dr. Wood knows of one foreign government that could soon announce they'll conduct much of their international trade in cryptocurrency. This is just one of Dr. Wood's must-see tips. Overall, this video report runs 90 minutes. So I can't disclose everything here. Initial Coin Offerings - you might know of them as ICOs. These privately held companies are allowing everyday folks to invest in them with specific crypto-coins. By January of 2008... $15 billion. January of 2011... $50 billion. That's a rise of 49,900%. Early investors in Uber could've turned $100 bets into $1.75 million windfalls. The problem is average investors weren't given the opportunity to back these startups. However, in this video Dr. Wood reveals what he describes as a "revolutionary" ICO that's about to debut and it could create $30 billion in new wealth. You'll even know how to get your stake for fractions of a cent compared to what others could pay. Bottom line, with this exclusive video of Dr. Wood, plus my new book The Beginner's Guide to CryptoCurrencies and my new volume called The Cryptocurrency Secret Weapon: Your Roadmap to the Digital Treasure Trove... you will be loaded up with very specific ways to safely make a fortune from this boom. Now I also have added two more reports I to give you as part of my Master Class Cryptocurrency Wealth Kit. Companies jumping into Blockchain have been skyrocketing. One company, a tiny Fintech firm soared 2,000% - in one week! Another soared 432% in one day! I don't want you to miss out on any of this. So, I scoured the markets and found the three best "blockchain" stocks positioned for massive windfalls right now. The report is called Three Stocks Set to Soar from the Cryptocurrency Boom. Again, this will be included in your complete Master Class Cryptocurrency Wealth Kit, at no charge. Any one of these stocks has 1,000% gain potential. So, you don't need to invest a lot to make a lot. You could literally start with $50 and turn that into thousands. That's how fast this market is moving right now. It's all in the Master Class Cryptocurrency Wealth Kit - everything you need to capitalize on this boom... from cryptocurrencies to blockchain stocks. You can bank massive profits if they play these events to their potential. And, in The Bitcoin Hard Fork Survival Guide, I'll show you how to position yourself perfectly every time one of these events occurs. In How to Profit from Multiple Cryptocurrencies with Just One, I show you an entirely new way to invest in cryptocurrencies. It’s called Prism and it’s ingenious. It allows investors to buy a basket of crytpocurrencies at once – divide up your stakes how you see fit – then cash out whenever you want. You’re in complete control – and you never have to use a crypto exchange. I spent nearly six months researching for this report, and I can assure you, you won't find this information anywhere else . Again, I want to send you everything in the Master Class Cryptocurrency Wealth Kit right now for free. Why would I want to do all this? With all the excitement and enthusiasm surrounding cryptocurrencies in the air right now, I want you to be the next smart person who gets the chance to turn a small investment of just $100 or so into a fortune in just a few months. The truth of the matter is that no one really knows how long this boom is going to continue for. It could even be over by next year, and you'd have missed the opportunity of a lifetime if you wait on the sidelines and watch millionaires being minted out of thin air. And with the downside being almost zero, there's minimal risk in putting a small sum of money into the current cryptocurrency boom cycle. What's important to focus on right now for new investors that a series of events is set to send the entire crypto-space into a parabolic rise. Russia, a country that had outlawed cryptocurrency in 2016, is now moving towards full legalization. In fact, Vladimir Putin recently sat down with one of the founders of this cryptocurrency to discuss using it as a tool to diversify the Russian economy. The Emirate of Dubai has also expressed serious interest. Crown Prince Sheikh Maktoum says he wants Dubai to "execute ALL transactions" with a program that includes this universal currency "by 2020." Even the White House is signaling that it is preparing for a future with blockchain technology at the forefront. Chris Liddell, assistant to the president and director of strategic initiatives at the White House said that "Perhaps most important ... is implementing foundational data standards now, so that the U.S. can be in position to harness the potential of blockchain and other technologies moving ahead. It doesn't take a genius to see that cryptocurrencies could be the future of money. And my research indicates that Ethereum could give investors an even bigger return than Bitcoin. Massive coming developments could make this blockchain reach billions of people. Now you have a cryptocurrency eco-system - with millions of investors raking in cash from this emerging technology. Ethereum is still only 2 years old, which is why investors are feverishly bullish on this promising new technology. Like I mentioned before, there is an upcoming series of events that will signal that it is "buy time", but with potentially less risk involved. The last time this event occurred... the price of Ethereum jumped over 100%. And the next phase is rumored to be only weeks away. My "formula" indicates that these events are going to be the defining moment for cryptocurrencies like Ethereum, and even smaller coins that have recently held initial coin offerings. And it is imperative that if you want to reap the rewards of early adoption, you are privy to the information that I cover in Master Class Cryptocurrency Wealth Kit which gives you the complete blueprint for profiting from today's (and tomorrow's) cryptocurrency boom. This includes The Beginner's Guide to Cryptocurrency - which will take you from novice to expert in no time. In this report, I've outlined everything you need to know to make your first step towards making thousands, if not millions from the cryptocurrency boom. But that is only a small part of what I'm giving you today. Including what to do before, during, and after the upcoming catalysts we just talked about. And how ERC-20 tokens, powered by Ethereum, could dominate the blockchain and its technology. The Cryptocurrency Secret Weapon: Your Roadmap to the Digital Treasure Trove. 7 Minutes to Seven Figures: How to Quickly Secure Cryptocurrencies For Pennies and Turn it into Millions! Retire on Crypto Easy Street: Flip on This 200% Income Stream, Kick Back and Watch the Paychecks Roll in! The Crypto-Billionaire's Roadmap to Unimaginable Wealth Featuring Dr. Gavin Wood. Three Stocks Set to Soar from the Cryptocurrency Boom. How To Profit From Scores of Cryptocurrencies For The Price of One That said - my publisher isn't particularly fond of big giveaways like this. So we have to limit the number of people who get my research today to just 500. I'd like to send you this entire Master Class Cryptocurrency Wealth Kit right away – for FREE. All you have to do is to become one of the first 500 people who agree to a 100% no-risk subscription to Nova-X Report. The Nova-X Report is your investment research newsletter focused on small little known companies from Silicon Valley and the tech industry. If this gives them a stranglehold on a sector with billions of dollars of potential that's what I'm looking for. The Nova-X Report takes folks behind the curtain, so to speak, so they can tap into the greatest source of individual wealth creation in the history of the human race. Just like Bitcoin, for instance. It was the hottest investment story back in 2013 and 2014. That's because just weeks before, I had met with several CEOs, founders, and venture capitalists in California. They were at the forefront, developing the currency exchanges and investment funds that would push Bitcoin into the headlines. At that time, Bitcoin was trading for $90. People from across the country were making hundreds of thousands of dollars. I look at investing in Ethereum and ICOs today just like I did Bitcoin back then. I believe it gives you the chance to become a millionaire. That's why I'm in this business — I want every one of my readers to have a shot at making a fortune for themselves. I was one of the first to recognize the potential for huge profits from rare earth metals because I personally knew the advisors and board members of many rare earth mining companies. This allowed me to target four specific companies - Rare Elements Resources Ltd., Avalon Rare Metals Inc., Quest Rare Minerals, and Great Western Minerals Group. And across the board, my team and I at Money Morning have time and time again brought the hottest venture capital-like stock opportunities to our readers. Some of these we've already closed out. Others are still open, and their peak gains are enormous. These are the types of opportunities I bring readers of the Nova-X Report. Every month I send members a hard copy and a digital version of each new edition of The Nova-X Report. Each edition comes with two exciting investment opportunities I've personally vetted. For instance, in a recent Nova-X Report, I shared a pioneer in "cryopreservation" technologies. This is just starting to be used in cardiac and vascular surgeries involving implantable living human tissue. Already, 1,000 surgeons at 800 facilities in the U.S. are implementing this company's breakthrough. But the growth is about to expand to 75 nations. In another Nova-X Report edition I found a company that developed a "honeycomb" advanced material. It could create the lightest and fastest aircrafts in history. Each monthly edition of the Nova-X Report provides a streamlined analysis of two massive trends and a thorough examination of two investment targets. I'll cover each company's financial strength, proprietary technologies, sources of venture capital funding, and profit projections. Then every week I'll release the Nova-X Progress Report. And whenever the moment arrives to collect any profits, you'll receive an instant trade alert. For instance, with Micron Technologies, folks following my research had the opportunity to get in and out of that trade in a single day. One reader even let me know he captured 140% from that play while on a cruise. Membership also includes 24/7 access to Nova-X HQ. This is my exclusive website where I store every intelligence briefing, investment recommendation, and alerts. And if members have any administrative questions with their subscription, I encourage them to take advantage of The Nova-X VIP Concierge Service. Today and today only I'm authorizing something special for folks who take action today. I'm going to let folks get a trial of Nova-X for only $39 – the lowest price I've ever offered. Like I said, I've never offered a subscription to the Nova-X Report for so little. But I want to do this for a very specific reason. 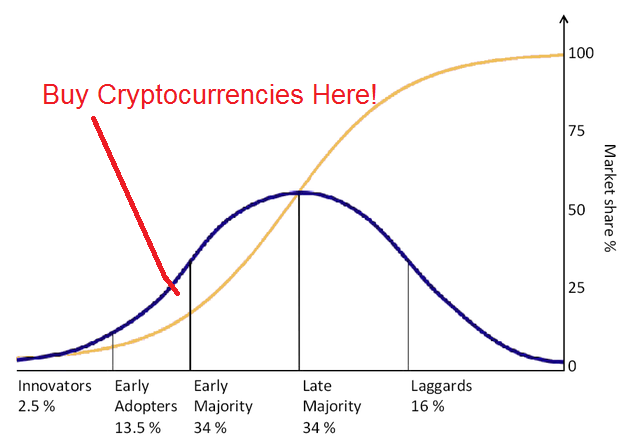 A lot of you know that I came out way before the recent surge in cryptocurrencies like Bitcoin and Ethereum. And for the thousands of folks who've already joined Nova-X... received my initial research on cryptocurrency- and made small investments in Ethereum-well the payoff was enormous. Like I mentioned, recently Ethereum began absolutely exploding. Folks had the opportunity to make thousands upon thousands of extra dollars. And a small stake in this red hot market could have made them instant millionaires. So I congratulate those people for going with their gut - being bold - and making the move to invest in crypto's. As I said before - I am looking at cryptocurrencies purely as a market analyst. When it comes to cryptocurrencies, all I care about is can investors make money in this market. And the answer is heck YES - and tons of it. A lot of folks stood on the sidelines the first go round. But I sincerely don't want them to miss this next big opportunity. A small stake in the cryptocurrency I'm recommending could make you more money in the stock market than you've ever made in your life! Remember, big catalysts are coming. So, I also don't want you to miss out as this cryptocurrency flies even higher than before. That's why I'm letting everyone get my entire Master Class Cryptocurrency Wealth Kit for free along with a subscription to my Nova-X Report for just $39 - the lowest price I've ever offered. I don't want price to be a deciding factor. I am going to do anything I can to give my readers a real shot at these life-changing gains! Again, let me repeat myself. This $39 deal is only being offered right now on this page. After today the cost will be $299. But if you're reading this right now, and you click the button below, you can try Nova-X right now for only $39. And just to put your mind at ease should you be dissatisfied in any way, I'm also authorizing a 30 day money-back guarantee. Simply contact me, and I will instantly return every penny of your membership dues. No questions asked. And you can keep the entire Master Class Cryptocurrency Wealth Kit, as my free gift, regardless of your decision. Video 1: 7 Minutes to Seven Figures: How to Quickly Secure Cryptocurrencies For Pennies and Turn it into Millions! Video 3: Retire on Crypto Easy Street Flip on This 200% Income Stream, Kick Back and Watch the Paychecks Roll in! All together this is a $893 value. This is a once-in-a-lifetime opportunity - you really have absolutely nothing to lose by giving Nova-X Report a try! But you must act fast, because as I said, there are only 500 spots available today. And in an industry this hot... those 500 spots are going to go quickly. Remember - it's a mutually beneficial relationship. You could have the potential to change your financial security for life, and I could have yet another person that I can call a satisfied subscriber. To claim yours, simply click the button below. This is Michael Robinson, signing off.